Call for lynching to be made a federal crime. Owing to the fact of the brutality treatment which has existed through out the United States of America. I now feel well justified in taking great pleasure as a citizen under the Stars and Stripes of this country, asking you in addition to your Speech of July 4th, 1918, to speak a few words condemning lynching and burning and make it a federal crime to any one who many comit such disloyalty crimes and many other unlegal things which has been existing through the United States of America. I am going soon to fight for the worlds democracy. This is all I ask of you. Hoping this will meet your approval. 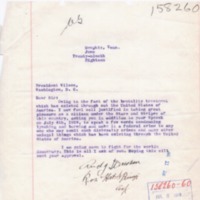 Dawson, Andy, “Andy Dawson to Wilson,” 1918 June 29, TI00137, Race and Segregation Collection, Woodrow Wilson Presidential Library & Museum, Staunton, Virginia.